1. Make sure your noodles are still fresh. After a few days in the fridge vermicelli noodles can get swollen and soggy which makes for a pretty mushy texture. If you’re making them from scratch simply boil some vermicelli rice or mung bean noodles according to package directions then rinse in cold water to cool. 2. Play with textures. 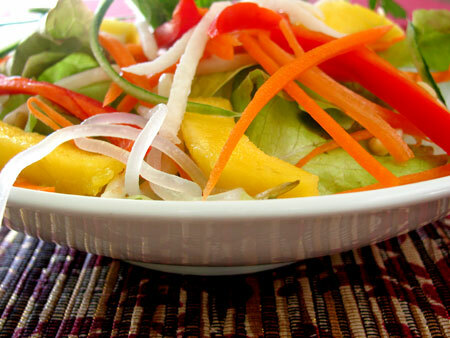 This salad has a lot of texture going on between slippery noodles, crunchy jicama, crisp bell pepper and carrots, soft mango and juicy cucumber. 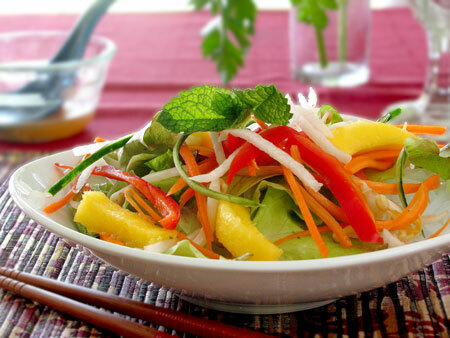 I love a Mango salad because the contrast between the mango and other ingredients is so surprising. 3. Have fun with color. There’s a lot of green in this salad from lettuce, herbs and cucumbers. I could use any color bell pepper but chose red to contrast the orange carrots and yellow mango. 4. Create powerful flavors. 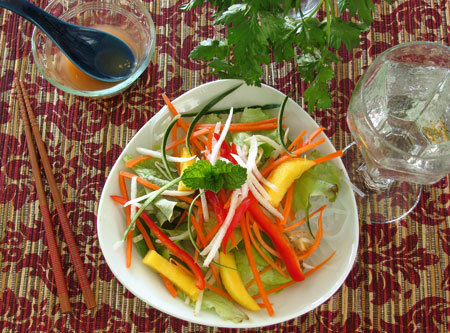 Thai cooking is easily identified by the diversity of its flavors. Every dish typically has salty, sweet, sour or tangy, and spicy flavors. The mango and bell peppers are sweet, that means I don’t need very much sugar in my dressing so I punch up the spicy and tangy with ginger, garlic, chili sauce and lime juice. I also use fish sauce which is a must in almost any Thai dish and adds a salty savory flavor. 5. Have fun with herbs. Fresh herbs are fantastic in salads, and especially ones where intense flavors are so desirable. Whole leaves of mint, basil, thai basil, lemon basil, cilantro, and parsley are great possibilities to add excitement to your salad. Like most of my recipes, the one below for salad dressing is meant to be a guideline, not a rule. If you like it spicier then kick up the sriracha, if you want your lips to pucker then go for more lime juice, and if you need a little sweet add a pinch of sugar. Have fun with this and make it your own! Use a fork to whisk all ingredients together in a small bowl. Spoon over noodle salad. Can be kept refrigerated in a jar for one week. Approximate cost/serving: Asian noodles are CHEAP! Just check out the noodle aisle at an Asian market and you’ll be amazed at the deals you can find. Although there are expensive items like bell peppers and mangoes in here, you don’t use the entire fruit or vegetable so this is a great way to stretch your pricier produce. The salad only cost me about $1.20 a serving. Vegetarian/Gluten Free: Yes and yes. Just make sure to use rice or mung bean noodles to avoid gluten. Oh this salad looks so refreshing! Love fresh mango in anything, and what a gorgeous way to eat it! Great tips. I think hese are all perfect for making a great thai salad. You are also making me realize that I love eating salads at Thai restaurants, but never make them at home. I really should. This is exactly what I was looking for! It may be January and we just had a major snow event here, but I need this touch of summer — maybe that’s WHY I need this touch of summer! Thank you Thank you Thank you!